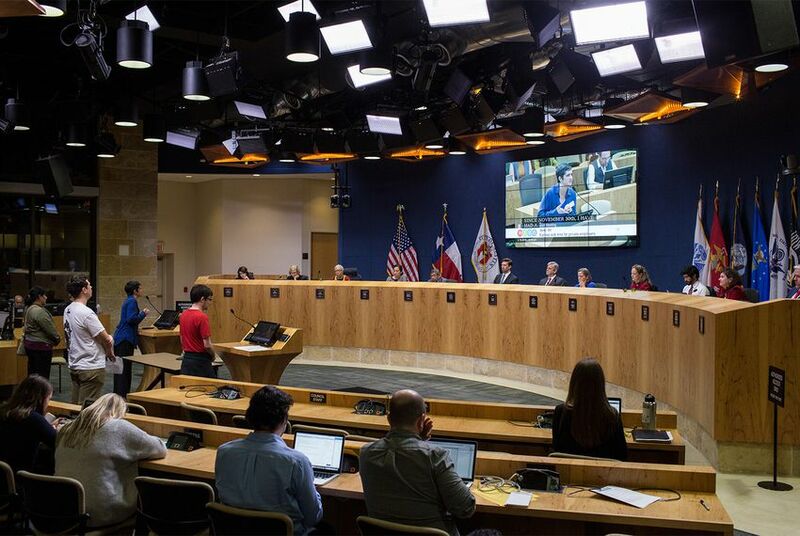 The Austin City Council on Friday morning approved a new rule requiring businesses in the city to provide paid sick leave for employees, but movement is already afoot in the Texas Legislature to kill the ordinance. At a meeting where over 200 people came to testify — a majority of them supporting the ordinance — the council voted 9-2 to implement the policy. But hours after the rule was passed, state Rep. Paul Workman, R-Austin, sounded off against the bill, saying the ordinance is “declaring war” on small private businesses. “It’s not the role of the government to mandate for employers to do this," Workman said. The new rule mandated that private employers allow their workers to accrue up to 64 hours, or eight days, of paid sick leave per year. Small businesses with 15 or fewer employees could have paid sick days up to 48 hours, or six work days. The passed ordinance is scheduled to go into effect on Oct. 1, making Austin the first Texas city to pass a paid sick-day ordinance. But Workman said he has already talked to a number of lawmakers in both the House and the Senate who will support legislation overturning the ordinance in the next session. “I will make good on my promise to file legislation on the first day possible to reverse this and the other liberal Austin policies they enacted,” Workman said. Those statements set the stage for the next fight over local control in the Texas Capitol. The conservative state government and the more liberal big cities have been at odds in recent years over issues like plastic bag bans, ordinances regulating who can cut down certain trees and regulations for ride-sharing and taxi companies. Conservative lawmakers have attempted to strike down city regulations, aiming to protect residents from regulations they view as overly obtrusive. Local governments say they are in the best position to determine what's best for their cities. The author of the ordinance, Councilman Greg Casar, said it was “disappointing” to see how lawmakers like Workman are already planning to override the ordinance in the next session. “We’ll just fight them tooth and nail at the Legislature," he said. Apart from legislators, some Texas business owners also opposed the rule. Skeeter Miller, owner and president of the County Line barbecue restaurant, said the city’s overreach into private businesses like his own are “disappointing,” particularly when the city gathers no input from businesses like his that will be economically impacted by the mandate. Microbusinesses, or businesses with five or fewer employees, were not exempted from the approved ordinance, but won’t be required to offer paid sick leave until October 2020. An attempt by Councilwoman Alison Alter to exempt all non-profit employers until Oct. 2019 did not pass, according to the Austin American-Statesman. Correction: A previous version of this story incorrectly spelled Alison Alter's name.